Outi says this handkerchief is dead. I'm inclined to agree. 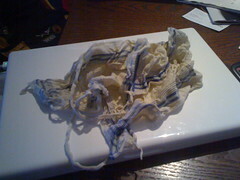 I like linen handkerchiefs, which tends to gross some people out. For them, human bodily fluids are things which you don't wrap up and put in your pocket after they've left the body. I, on the other hand, personally like the fact that linen handkerchiefs are washable and reusable. And they don't irritate the skin. Of course, even reusable things exceed their maximum lifespan at some point. Here's one such case. "Main_blogentry_161206_1" last changed on 16-Dec-2006 13:38:42 EET by JanneJalkanen.